For Martha, belts count as jewelry since making these chain belts falls in the “jewelry” chapter. I’m more of a belt-as-accessory kind of girl, but I suppose that’s all semantics. Chains are easy, people. All you do is buy some chain and then add clasps. The biggest problem is finding the chain, which I mentioned before. There’s a good selection at M&J Trimming in NYC, and you can order them online, so that’s a good choice. You know, easy breezy, I just used the leftover chain I had. If I had more, I probably would’ve made these a little longer. At first I was all, “meh,” but now I kind of like it. I’m not really much of a belt wearer. But it’s cute. 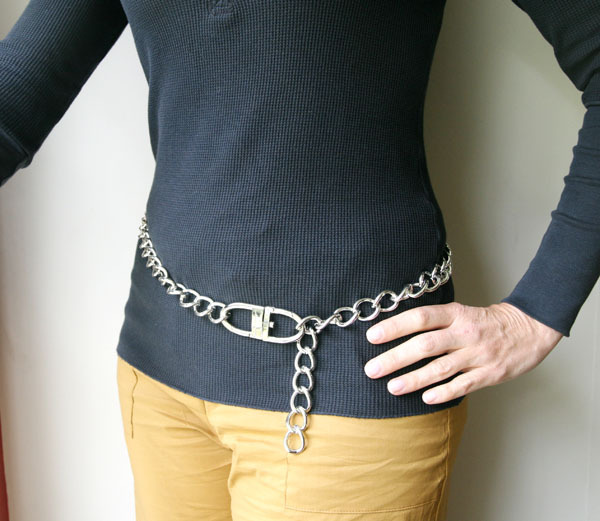 All you need to buy in addition to the chain is a belt buckle. This one I bought is actually a purse clasp thing, but I liked the aesthetic of it better than the other buckles they had at the fabric store. It’s also nice because it’s easily adjustable by hooking into whatever link works best. I mean, not even. With the belt, I just had them give me exactly the length I wanted at the store, so all I had to do was hook on the buckle. Definitely. 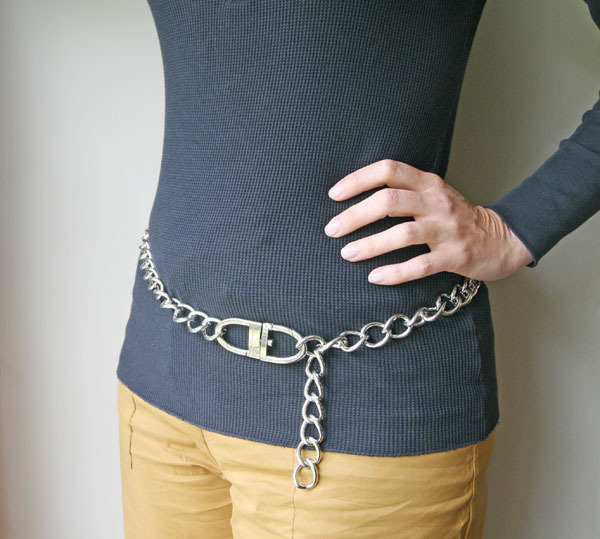 If you are looking for a chain belt, it almost doesn’t make sense to buy one. For example, here’s a simple chain belt from CAbi, which is like Tupperware for clothes (you go to parties to buy their stuff; my SIL just had one and I bought a few things). Cute, right? It’s $59. And I made mine for $16. The necklaces can be cute, too; I think they work best layered. Being not a big belt fan myself, I’m surprised at how much I like that belt! The necklaces look quite cute, too, but I wonder what a longer (possibly doubled- or tripled-up) one might look like. I love the ease of these, the price, and the cuteness! Oh, it’s cute! I like it. When I get my waist back I’ll make one. Love that! Oh and also? I will no longer believe you when you kvetch on MyFitnessPal. You’re so slim and trim!